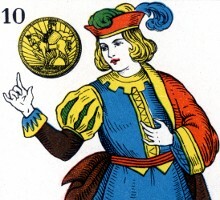 Above: a wood-engraved 4 of cups with the typical Solesio trade-mark suggests a traditional Spanish-suited pack. The single-ended King produced by the Real Fábrica in Rio is from a French-suited pack. 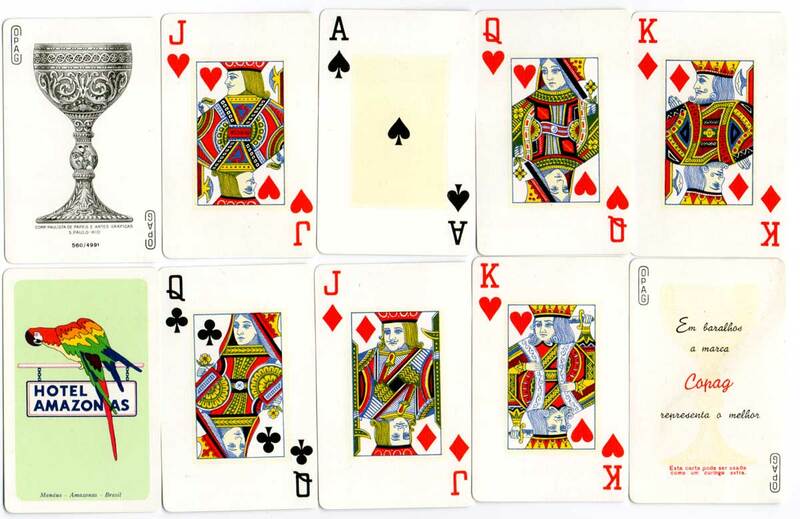 Above: two cards made by Azevedo, Recife, c.1925. 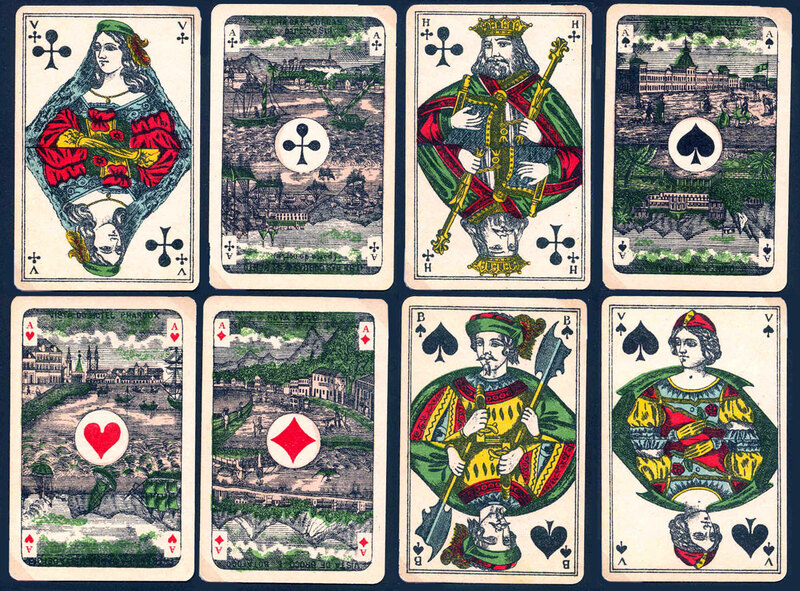 Packs with Scenic Aces had been imported into Brazil since the 19th century. Brazil was officially discovered in 1500 by the Portuguese navigator Pedro Alvares Cabral. Brazil's history encompasses elements from its native culture, from European colonisation and African influences which combine to create the diverse, exciting and vibrant culture that we associate with the country today. Printing in Brazil was controlled by the Portuguese government, although some unauthorised printing did take place. 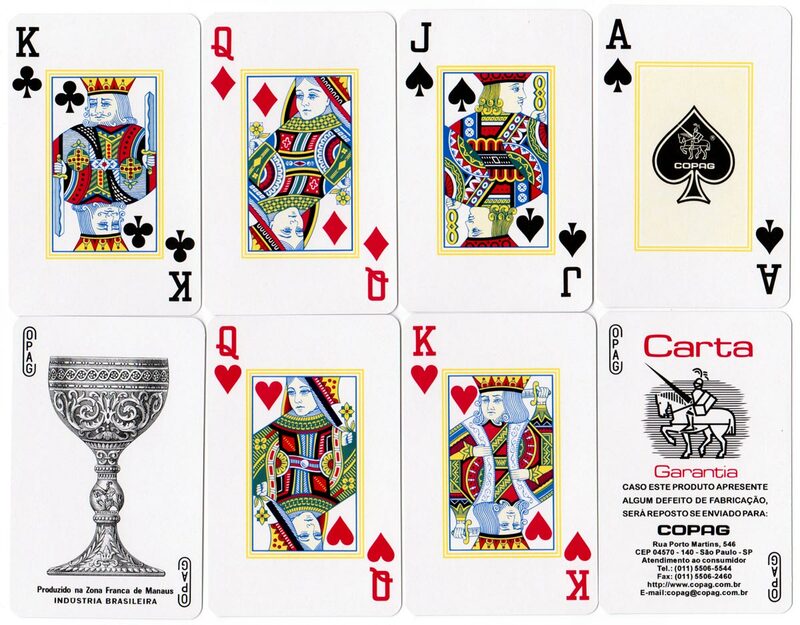 Playing card production in Brazil was officially sanctioned when a royal alvará (charter or document granting certain rights and privileges) of August 8 1770 gave privileges and tax exemptions to people occupied in making playing cards in Bahia. 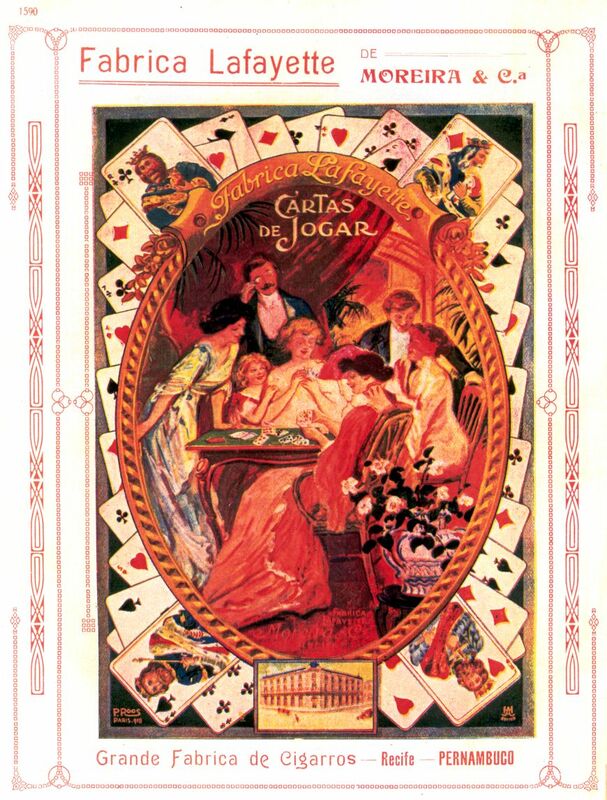 A royal decree in 1808 established in Brazil the Real Fábrica de Cartas de Jogar as a part of the Impressão Régia, a similar arrangement as that in Lisbon, for the printing of playing cards. The monopoly came under treat when clandestine playing card production was discovered in Bahia and its machinery and utensils were confiscated by the Fábrica de Cartas in 1815. Furthermore, playing card smuggling in Bahia was denounced in 1817. 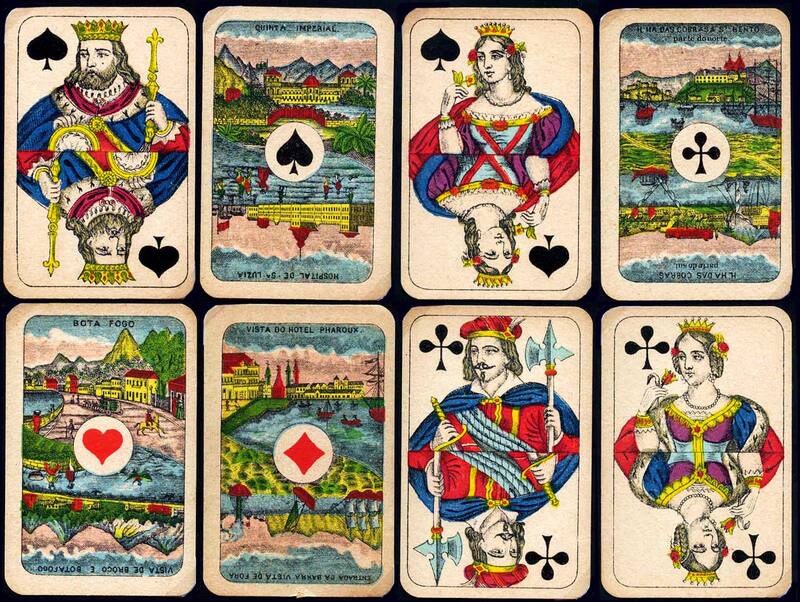 In 1818 the Royal Playing-Card Factory was leased to Jayme Mendes de Vasconcelos & Cia. but the contract was cancelled in 1823 due to failure to pay the rent. The monopoly for the playing card trade was abolished the following year. 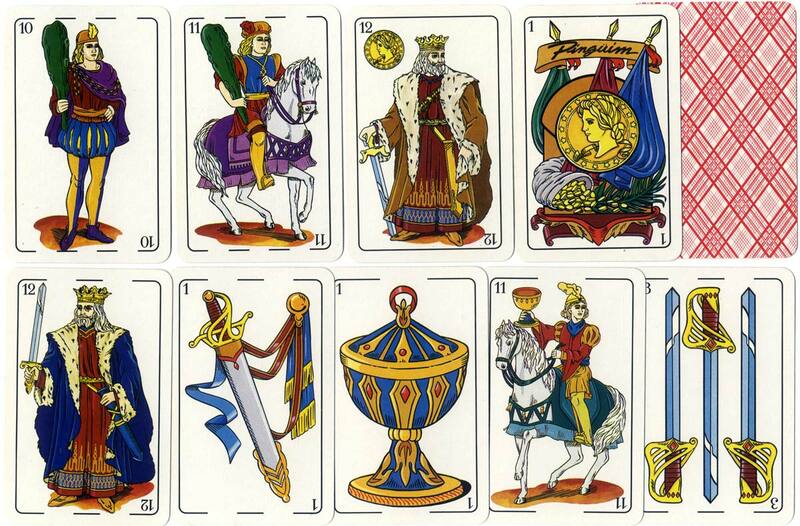 No Spanish-suited court cards from the Real Fábrica have survived. In 1824 Angelo Bissum, Manuel Luiz da Costa and Antonio José Polycarpo were granted permission to open their own playing card factory. 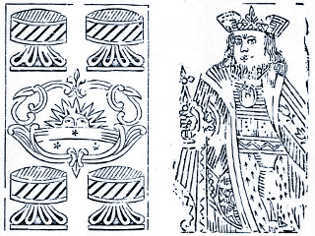 An 1826 newspaper advertisement offered Portuguese playing cards made in France for the same price as the cards made in Rio de Janeiro. 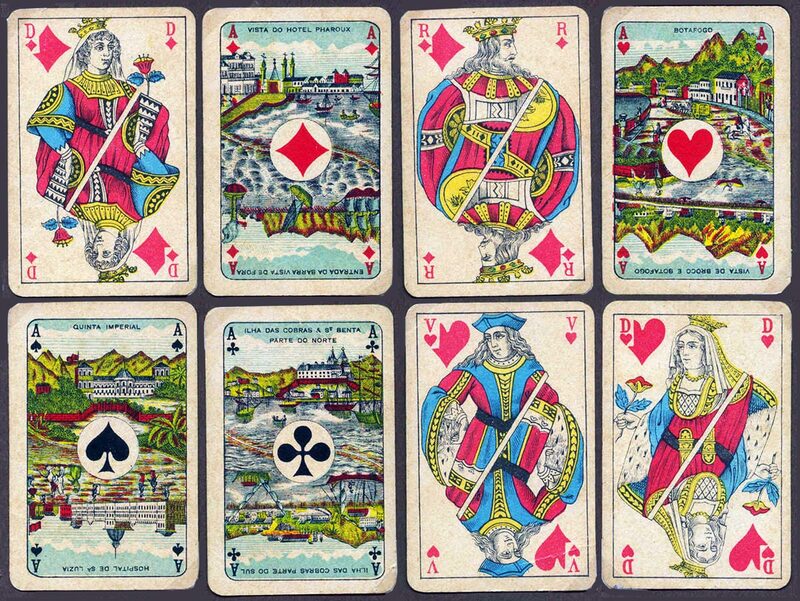 Various foreign printers and playing card makers are known to have settled in Brazil during the 19th century. Azevedo (Fábrica Caxias) and Lafayette were cigarette makers in Recife, Northeast Brazil, at the turn of century. They had a lithographic press to print cigarette labels and also used their machines to make playing cards for some decades. 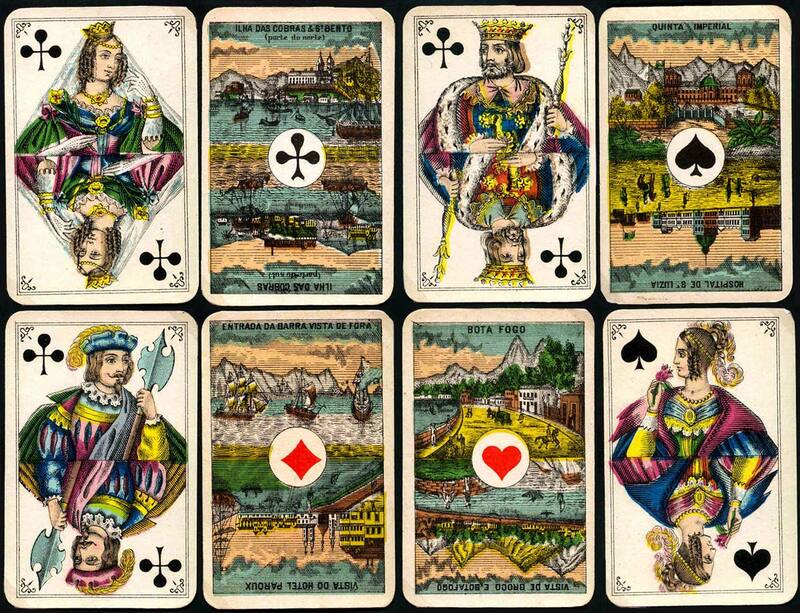 It was probably because of the demise of the Real Fábrica de Cartas de Jogar that Belgian and German manufacturers virtually took over the Brazilian and Portuguese markets, and also brought on the demise of the Portuguese pattern in favour of Spanish, German and English patterns. 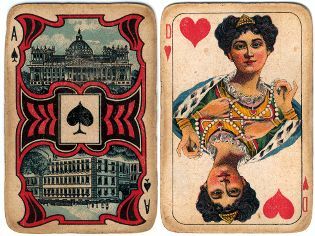 During the late 19th century there was a vogue for playing cards with exotic scenes on the four Aces which continued well into the 20th century. The German manufacturer C.L. Wüst produced a fine Brazil Scenic Aces deck. 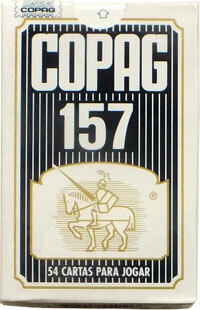 Many others were produced by Belgian manufacturers and marketed as Cartes Portugaises ou Brésiliennes. SOIMCA (Sociedade Impressora Caxiense) is another important maker. It was established by Nelson Soares in Caxias do Sul, in the south of Brazil, in 1955. Its "Pingüim" brand is very popular. 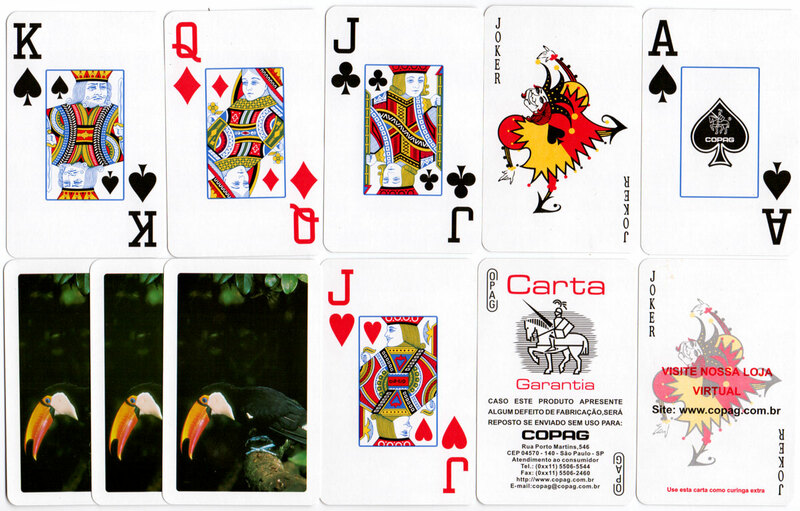 Soimca have produced several Spanish-suited decks, as well as standard Anglo-American decks with or without advertising and packs for foreign markets. Their standard Joker depicts a penguin. In 1999 SOIMCA jointed forces with COPAG, transferring its machines to Manaus.